Love is in the air at North Georgia Zoo! 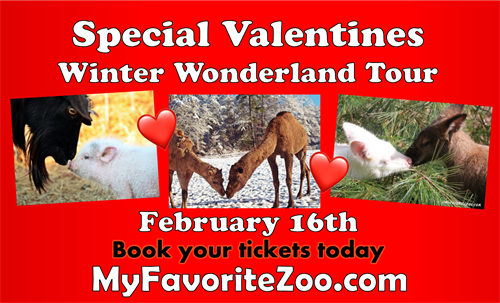 Join us for our special Valentine’s Day Winter Wonderland Tour! February 16th Tours start at 12p & 2pm, reservations are reccomended. Learn about romance in the animal kingdom. Special Valentine Enrichment will be given to the animal for everyone to fall in love with. After tour get your picture taken with a baby animal, so you can remember this special day. Bring in a present* for the animals and get a free feed cup!